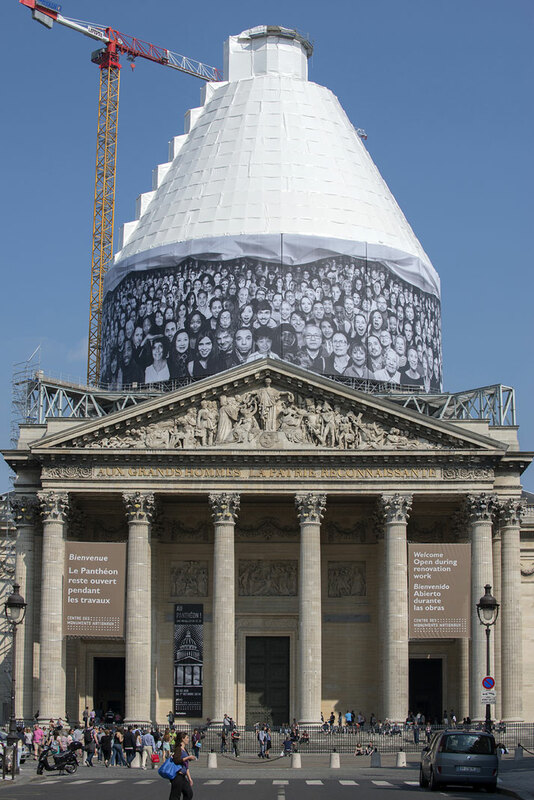 French artist JR has recently installed a series of massive collages at the Panthèon in Paris, France, in which his signature black and white portraits ''of people making faces'' have been pasted on the historical building’s floor and dome. 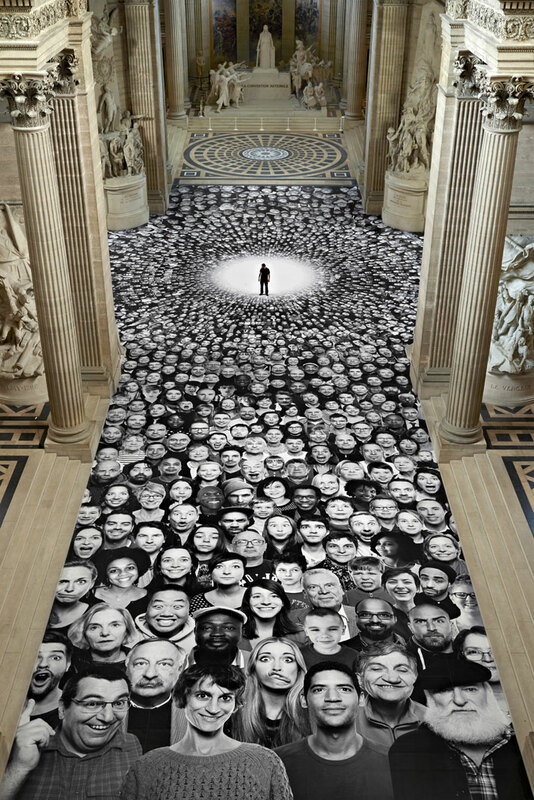 The intervention itself came about through the Centre of National Monuments (Centre des Monuments Nationaux) which commissioned JR to create a participatory work inspired by his INSIDE OUT project, thereby encapsulating the humanistic and universal values embodied by the Panthèon. photo © Didier Plowy - CMN. 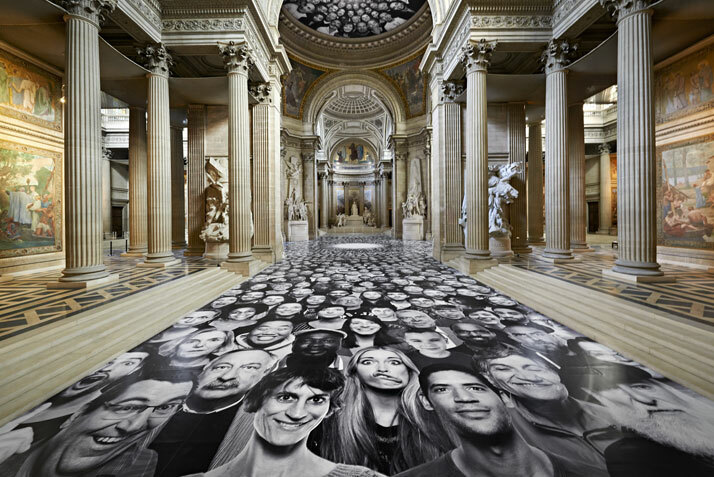 For the INSIDE OUT ‘Au Panthèon’ project, JR used portraits of people from all over France which were collected through his Photo Booth truck; the truck traveled to nine different locations across the country during March 2014, giving people the opportunity to participate through having their portrait taken. Participants were also given the opportunity to submit their portrait themselves by uploading them onto the project’s website. 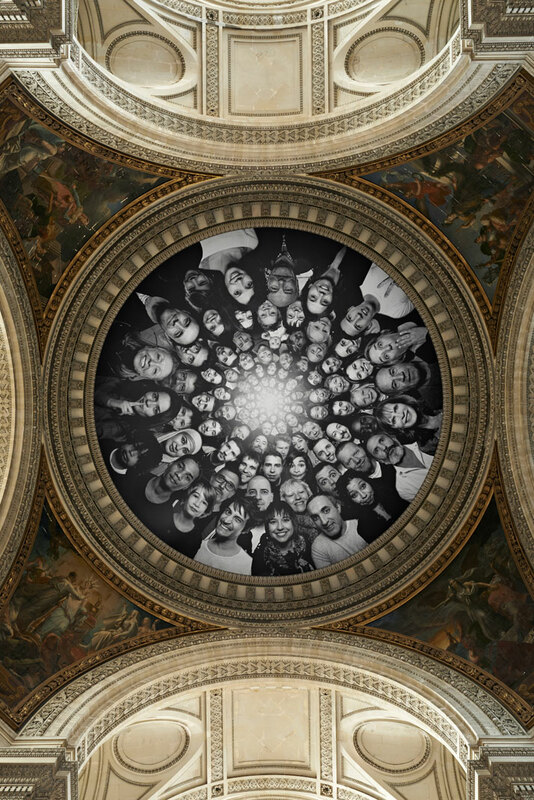 As a result, everyday people from all over France have now joined (if not temporarily) the ‘pantheon’ of the famous men and women who have shaped their country’s history and future. Erected between 1764 and 1790, the Panthèon was originally a church dedicated to Saint Geneviève, the patron saint of Paris, before it was turned into a mausoleum for distinguished French citizens (its vast crypt is the burial place of notable figures such as Marie Curie, Voltaire and Jean Jacques Rousseau to name a few). 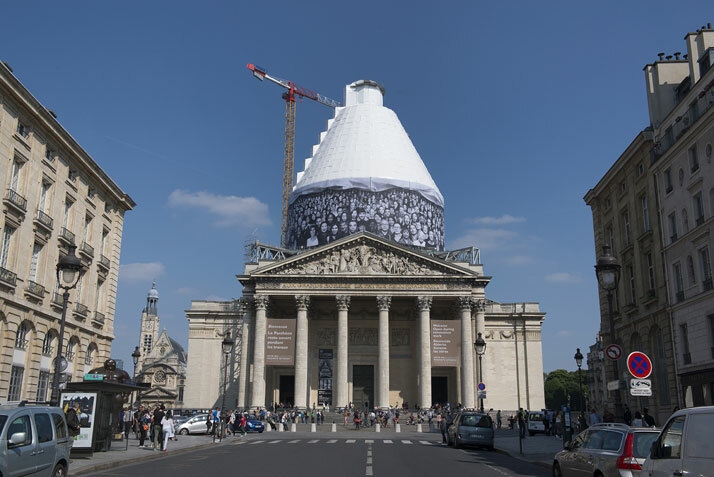 With the monument currently undergoing a large-scale restoration (presently the largest project of its kind in Europe), with the main focus on repairing the triple dome and its supporting structures, the dome’s exterior will remain covered for the duration of the restoration (expected to be completed somewhere between 2015 and 2022), JR’s artwork covering the dome’s exterior colonnade will be on display until the restoration completion! The other two large-scale collages inside the Panthèon will be on display only until 5 October 2014. The INSIDE OUT project was originally proposed by JR in his speech during the TED conference in 2011, a proposal which eventually won him the prestigious TED Prize together with a grant to help him realise his dream. Since then, over 200,000 portraits of people from around the world have been pasted in public spaces as a way to promote ideas and awareness about social and political issues, or as the organisers state on the project’s website, as a way to ‘‘transform messages of personal identity into works of public art.’’ Today, the INSIDE OUT project functions as a worldwide platform for social change, with a website that helps people either participate in an existing campaign, or launch a new action in their own community.